The dry leaves have a nutty, green, popcorn aroma. The infusion is green-yellow with an aroma of popcorn and a taste of rice crackers with light green notes and a hint of astringency. 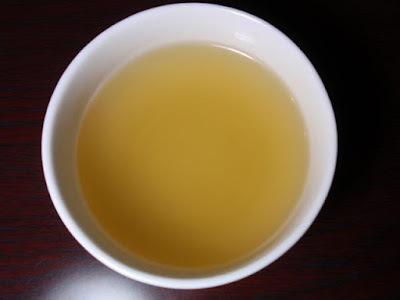 This was an unlabeled sample provided at a tea workshop. The age wasn't apparent and the rice dust coating the dry leaves gave the impression that this tea might be beyond its ideal lifespan. The results were pleasantly surprising. 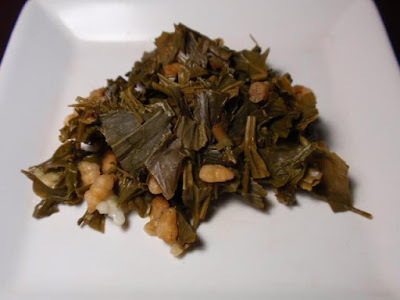 Even with the volume of roasted brown rice in the sample, the green taste of the leaves wasn't lost. 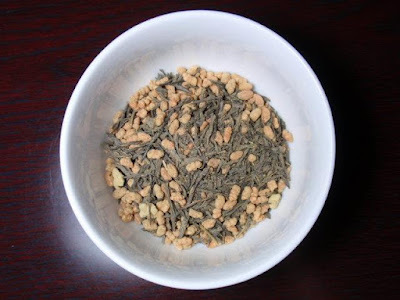 It doesn't stand up beyond the first steeping which is expected with most genmaicha.